Kitchen remodeling in Santa Ana CA can be a big investment. It’s important to trust your investment to a true professional like Cabinet Magic. Cabinet Magic offers the quality construction and installation services you expect from a licensed contractor, along with excellent prices on designer products and as much or as little design assistance as you may require. Going for a bold new look with kitchen remodeling in Santa Ana CA can be exhilarating. But you may also feel a little bit worried. After all, what if the countertops, flooring, paint colors, light fixtures, or other design elements you’ve chosen don’t look quite right when they’re all put together? 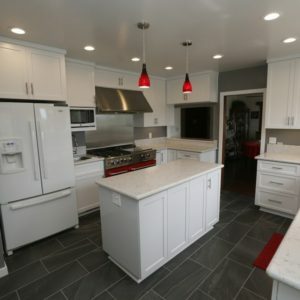 At Cabinet Magic, we understand how important having an accurate visualization of the finished kitchen remodeling in Santa Ana CA is for your comfort and peace of mind. That’s why we offer 3D computer rendering services on every remodeling project. You’ll be able to see and approve all aspects of the design down to the last detail before we begin work. Most people opt for custom cabinetry because they want a truly unique look with cabinets perfectly suited to their style and their space. But custom cabinetry also delivers another very important benefit: custom functionality. After nearly 30 years in the business, our skilled craftsmen have truly mastered the art of custom cabinetry. We can match any architectural style and also include all kinds of functional accessories from lazy susans to pull-out trash bins to appliance drawers and more. We take pride in our exceptional craftsmanship and we are confident our cabinets will last for decades. Take the first step towards beginning your kitchen remodeling in Santa Ana CA today by contacting Cabinet Magic at 800-828-4380 and requesting your free in home consultation. We can help you price the upgrades you want and give you a free estimate.